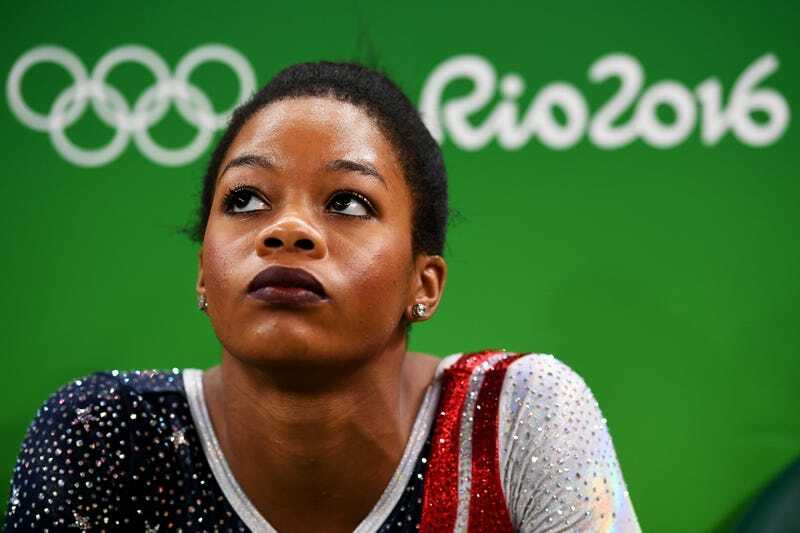 Last year in Rio, Natalie Hawkins, Gabby Douglas’s mother, gave an interview to Reuters about the online bullying her daughter had been subjected to during the Olympic Games. Everything Douglas did—or didn’t do—was cause for criticism. She was attacked for not holding her hand over her heart while the national anthem. She was criticized for not appearing sufficiently overjoyed when Simone Biles and Aly Raisman won a standing ovation when they went 1-2 in the women’s all around final, a final Douglas had missed out on because of the “two per country” rule. It seems like it is finally the time and place to tell that story. More than a year after Hawkins cryptically alluded to some trauma that was not yet public, Douglas confirmed that she—like 2012 Olympic teammates McKayla Maroney and Raisman—had been sexually abused by former USA Gymnastics team doctor Larry Nassar. Douglas’s revelation was less direct than Maroney’s, who, in a statement posted to Twitter, went into detail about the times and places that Nassar abused her, or Raisman’s, who went on 60 Minutes with her parents to talk about what happened to her and also described it in her just released memoir. This tweet caused quite an uproar, with everyone from Biles to Raisman’s mother, Lynn, tweeting their disappointment with Douglas’s underlying message—that women bear some kind of responsibility to prevent their own assaults. The tweet has since been deleted—though not before it was screencapped by Biles, who came to Raisman’s defense—and Douglas issued an apology that same day. The Friday apology on Twitter included the #MeToo hashtag, which, like her mother’s comments in Rio, suggesting that perhaps there was more to this story. Douglas doesn’t use “I” in this statement when it comes to speak about the sexual abuse; she says “we.” Perhaps it’s partly a show of solidarity with her abused teammates, or maybe she’s still struggling to come to terms with what happened and doesn’t want to phrase it as an “I” statement. No matter. The message was clear: Like more than 140 other women and girls, Douglas, the first African-American woman to win the Olympic all-around gold, had been sexually abused by the team doctor. USA Gymnastics understands that sharing one’s personal story of abuse requires courage and fortitude. We admire the strength shown by Gabby and her teammates in speaking out publicly to hold a predator accountable. The conduct of which Larry Nassar is accused is appalling, and we are very sorry that any athlete has been harmed during her or his gymnastics career. Our athletes are our priority. We want to work together with Gabby and all of our athletes, members, parents and professionals to promote an environment of empowerment that encourages speaking up, especially on difficult topics like abuse, and we are committed to further developing a culture that has safe sport as a top priority throughout the organization. The organization has taken specific and concrete steps to prevent future abuse by adopting the USA Gymnastics Safe Sport Policy; hiring a new president and chief executive officer who emphasizes empowerment throughout the organization; building a safe sport department that is developing a comprehensive education plan for members; and creating an implementation plan for the recommendations made by an experienced, former federal prosecutor who carefully examined the organization’s past policies. The Safe Sport Policy strengthens policies that include mandatory reporting, defines six types of misconduct, sets standards to prohibit grooming behavior and prevent inappropriate interaction, and establishes greater accountability. These changes are long overdue. However, they come too late for Douglas and her teammates, who had to compete under unfathomable pressure while privately grappling with sexual abuse.